Patrick has been learning about Disney World. For a time when asked where he lived he said Disney World. Patricks wish granters would send a package every once in a while to let him know that it was still happening. A few months ago we got the dates for the trip. There was a lot that needed to happen between then and the trip, so it got put off in our minds. We had a trip to Omaha, I had a business trip, Patrick started Kindergarten, and we had an attempt at camping (gee most of those should be blog posts, I’ll see what I can do about that). A few weeks ago we got a call from one of Patricks wish granters Beth, she told us that they were working on planning a wish granting party. Something to tell Patrick that his wish had been granted, and he was on his way. About a week ago we got details of his wish granting party. And started inviting family, and close friends (sorry to those that didn’t get invited, the group was fairly large and we didn’t think it would be right to go larger, we still love and appreciate you). We had coordinated the details with Beth. We would send Patrick to the neighbors, the guests would come, and then we would surprise him, and then an ice cream truck would come as the cherry on top. As with all things in our life, things change. Emily started exploring some new therapy for Patrick yesterday. They said great would it be possible to come tomorrow afternoon. This caused our plans to change a bit. The new plan was that I would come home early and meet everyone, help Beth and Natasha setup and then Emily and Patrick would arrive home from therapy to a group of friends. With the contingency that if they got back too early they would play at the neighbors. I got home from work early thinking I needed to help clean the house. Cleaning the house with Patrick around is sometimes an effort in insanity. When I arrived home Emily had the house in great shape. I sat down and read for a while. Then I decided to grab some chairs. As I got outside Beth pulled up with balloons. We tied balloons around our front yard. Guests started arriving. Natasha arrived with more balloons, which made things look all the more festive. The majority of the guests arrived, and I texted Emily to let her know we were ready. Patrick was taking in all his guests at his surprise wish granting party. Patrick got out of the car as fast as Emily could get his door open. Ran to the driveway and just grinned. He saw the present that was waiting for him on the porch and ran to it. Beth cut him off, and presented him with a certificate stating that his wish was granted. Then he resumed his quest for the gift. our house and Beth leads him over to the truck. Emily got there just in time with Patrick safe (soy) ice cream. 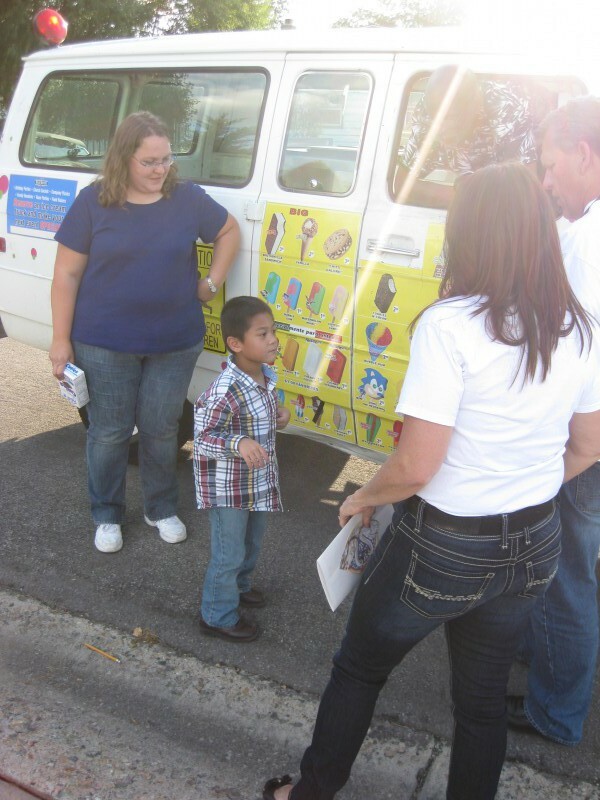 Patrick was more fascinated with the van than the ice cream, but none the less it was a hit. The rest of the evening was spent with everyone getting ice cream, and Patrick running from person to person hugging and saying hi to them. Then Beth let him play with her car (big points from him). And she led him up and down the street naming all the car makes, which is one of Patricks favorite games. other house (he’s been to Disney Land a few times). The night was great. Big thanks to those who came. Even bigger thanks to our wish granters Beth (and her husband Tim who accompanied her tonight), and Natasha. We are super excited to go on our adventure. The ice cream truck came just for Patrick. 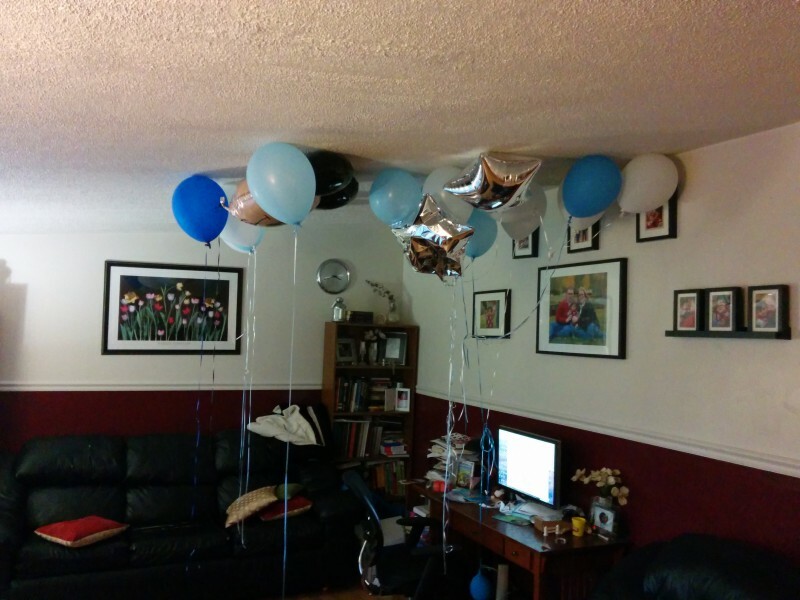 The left overs of the balloons. Each child took one home as well. This entry was posted in Adventures, Aunts Uncles & Cousins, Family, Family Fun, Grandma and Grandpa, Granny and Papa, Make A Wish on September 17, 2014 by geekino. Well, despite the fact that Patrick spent most of the week before doing forbidden things and saying “naughty, naughty, naughty,” Santa still came to Patrick’s house. I was very excited to share Christmas with a little boy finally old enough to understand. In fact, I was wide awake at 5 a.m. after having a horrible dream about needing to collect a sample to test for C-Diff… and could barely get back to sleep because I knew it was Christmas! Patrick, on the other hand, slept until 9. Brian and I actually got up and started making breakfast before the little munchkin dragged himself out of bed. Who was I to argue with him sleeping in on a day when naps would be near impossible? He loved opening presents, though wasn’t so keen on the fact that mom and dad kept taking the new toy away to give him another present to open. Still, it was quite the Christmas complete with lots of Elmo, cars, new clothes, books, and a stocking with goodies of bottled water and puffs. Then, we finished breakfast. I found that I could make decent eggless milkless pancakes from a mix, so we made some silver dollar sized pancakes for Patrick and some big, fluffy, pecan laden pancakes for mom and dad. We ate and then, still in PJ’s went to take presents grandma and grandpa. The rest of the day we visited family. We had a big family get-together with my family at my grandpa’s house. The place was so packed with cousins and gifts that you could barely walk! We spent the evening with Brian’s family. 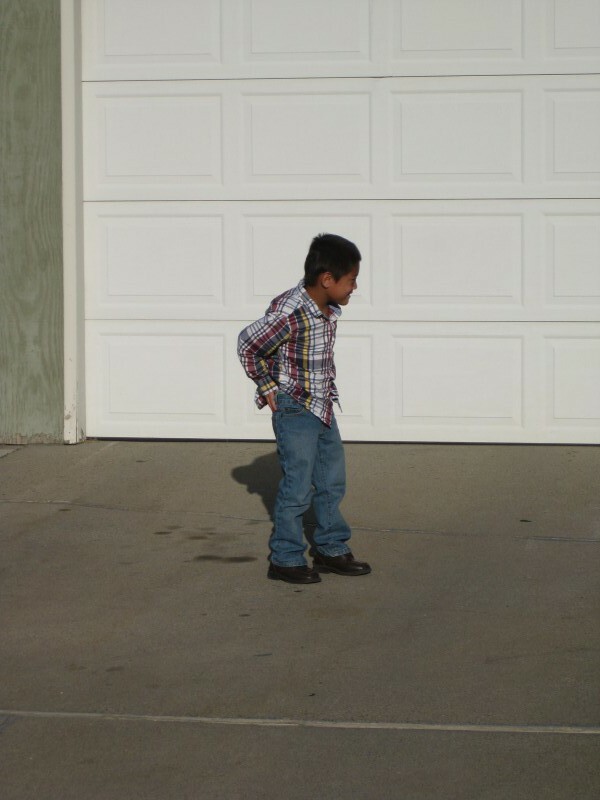 His brothers drove in from out of state and for the first time in years, the whole family was together on Christmas day. At last, exhausted, we headed home to bed. Christmas was everything I could have dreamed! As I reflect back on this Christmas season, I realize just how blessed we have been this year. In the midst of all the hustle and bustle, the presents and family and good food… I’ve had a few little moments where I realize that we have been given the greatest possible gift this year. Our little boy was able to share in all of the Christmas magic with us. This year, Brian’s company party took us to the theater for a production of A Christmas Carol. You know, I think I’ve seen or read that story at least a hundred time in many, many formats. I’ll admit, the character Tiny Tim has always seemed a bit romanticized to me.. how could a little boy really make THAT big of a difference? This year, it took a conscious effort to hold back the tears. Having Patrick in my life has taught me just how a very special child can really touch hearts and lives. I understand why Bob Cratchit would stay working for that awful Scrooge. And what’s more, I understand why Christmas in their house was so very special. Happy, grateful, please with one another, and contented with the time. That is how I’d describe our Christmas this year. With our own Tiny Tim, each seems a little more precious. Yes. We had a very merry Christmas in our house. This entry was posted in Aunts Uncles & Cousins, Christmas, Family, Family Fun, Grandma and Grandpa, Granny and Papa, Holidays, Traditions and tagged Christmas, family, family fun, gratitude, lessons I've learned, parties on December 29, 2010 by geekino. I can’t believe it! We actually made it to Yellowstone this year! Those of you who know where we were last year when we’d planned a trip to Yellowstone can maybe understand how monumental this is. The trip up didn’t go without incident. (See the blog entry at this link for detailshttp://www.cotaforpatrickh.com/node/1001), but we arrived in West Yellowstone Thursday afternoon unscathed, despite an extra 2 hours sitting in traffic. Because we arrived a bit late, we didn’t have time to go into the park the first day. So, we wandered around West a bit. First we had lunch at a little cafe we discovered in winter a few years ago. It’s a small place with a very local, small-town feel. We were so surprised when we told the waitress Patrick was waiting for an intestinal transplant and she told us the owner’s daughter, age 30, was listed for one, too. That, plus Patrick’s usual flirtatious play, won her over quickly. After lunch, we shopped for souvenirs and took Patrick to play at the city park. Then, after doing Patrick’s daily TPN change, met the rest of Brian’s family at the playhouse. Yup, Patrick went to his first play. It was Disney’s Beauty and the Beast put on in a tiny little room that seated maybe 100 people. The cast was also ushers and consession sales. Patrick did really well, I think. He watched a lot of the play.. liked the songs.. but was nervous about the Beast. And, of course, he always gets jumpy when there’s applause involved. After a dinner of buffalo burger and huckleberry ice cream, we turned it… It was nearly 11 by the time I got meds, fluids, and PJ’s all in order and got Patrick to stop tearing around the room and go to sleep. The next morning, Friday, we actually made it into the park for a day of walking through geyser basins and looking for animals. (We spotted a baby black bear and a bald eagle, among other things.) Brian and his brother did and impressive job maneuvering a stroller around stairs and hills in the trail. Patrick did well for the first half of the day, and was pacified well enough by looking at books and toys on the ride back. After dinner, we decided to turn in early.. we were sunburned, sore and tired. It’s a good thing, too.. because Saturday morning he was up and whimpering around 4:30 a.m. Finally, I gave in and pulled him out of his crib and into my bed…. only to remember why we don’t do this. He tosses and turns and about kicked us both out! Around 5:30 he decided it was awake, anyway, and we gave in and got up and packed. We went to breakfast early at the same cafe where the waitress was thrilled to see him. Then, we went into the park to see Old Faithful. Patrick surprised me by actually being interested in the geyser, though the pictures don’t show it. We left about noon and Patrick and I slept at least half of the drive home. By the end, he was pretty tired of being in his carseat and pretty bored with the same selection of toys. Isn’t that part of a roadtrip, though? What a great few days it was! It was nice to have finally made it.. and best of all, to Yellowstone, which is such a big part of the Hoopes family legacy. We’re so grateful we were able to share it with Patrick at long last! I’m not feeling quite as superstitious anymore about saying the “V” word. This entry was posted in Aunts Uncles & Cousins, Brian, Family, Family Fun, Granny and Papa, Traditions and tagged funny things Patrick did, road trips, vacation, Yellowstone on July 11, 2010 by geekino. Today, they asked for Patrick and his family to come and be interviewed for their morning school news. What a treat this visit was! We got to meet the 5th grade class who’s been spearheading the fundraising efforts. (Pictured above). I was amazed at how much they knew about Patrick already. And at how well thought out their questions were. They wanted to know about his TPN. (They knew it by name). And why he needed his nutrition to go to his heart instead of his belly. Two kids took us to the faculty lounge where they did an interview that couldn’t have lasted more than 2 minutes. It was so well rehearsed, though, and very professional. When we told the kids that Brian had gone to school here years ago, they were pretty excited. But when the camera’s rolled, it was all business. All of the kids were so excited to meet Patrick! Brian’s mom is the secretary at this school so some kids put 2 and 2 together when they saw her with him. We started to hear “Is that Patrick?” whispered as soon as we entered the halls. Soon, kids were chasing us down the halls to be able to meet him. My favorite quote of the day was from a little hispanic girl who said, “I thought he was all white. But he looks a little brown.” In school where the “minority” population is the majority, it was nice that Patrick, with his Korean features, fit right in. The generosity and kind-heartedness of these children is amazing! For weeks, they’ve been sneaking in before school to put money into donation boxes. One teacher lifted theirs today and struggled under the weight. Pennies for Patrick was scheduled to end last week. The school voted to extend it till the end of this month, though, because they were having such a good time. My heart was so touched. I wanted to cry, but couldn’t wipe the smile off my face as we talked with all of these children. Edison is not in a wealthy neighborhood. Many of these families don’t have much themselves. But they are so proud to be giving to help our son. This entry was posted in Fundraising efforts, Granny and Papa, Patrick and tagged community support, Edison Elementary, fundraising, Pennies for Patrick on April 20, 2010 by geekino.